P-NET communication can take place on many different media types, such as Ethernet, RS485, Light-Link, RS232, WiFi, Internet, and GPRS. Ethernet has its advantage at the large bandwidth. P-NET on Ethernet, the P-NET protocol and Ethernet is used as a transport medium for P-NET packages. PROCES-DATA recommends using only Switches to form the network. An Ethernet switch ensures that communication packets are only sent to the relevant members on the network. For PC Monitoring this communication form is highly suitable and gives any PC connected to the LAN network a simple access to the process or production facility. Due to the wide acceptance of Ethernet in the PC industry, network components are available from many suppliers in industrial or office designs and with various features. If the Ethernet has no connection to the Internet or other external networks, the configuration is as simple as setting up a normal P-NET. The electrical specification of P-NET is based on the RS485 standard using a shielded twisted pair cable. This allows a cable length of up to 1200 m without repeaters. P-NET interfaces are galvanically isolated, and up to 125 devices per bus segmentcan be connected, due to a special clamp circuit, and again without the use of repeaters. P-NET is a multi-master bus, which can accept up to 32 masters per bus segment. All communication is based on the principle, where a Master sends a request, and the addressed Slave returns an immediate response. P-NET Light-Link provides an optical communication link for P-NET. P-NET Light-Link is the means of communication between 800/600 series modules. The common Tx and Rx optical paths are automatically connected between terminal modules during placement, and an optical “spur” connection is made available to any electronics modules that are fitted. In copper wiring terms, using Light-Link is equivalent to daisy-chaining a 3-wire connection between each module, but without having to perform the time consuming and bulky physical connection. Such an optical medium obviously provides galvanic isolation, but since light signals are received, amplified and transmitted at each node junction (acting as a repeater), this ensures optimal Light-Link signal anywhere in a cluster of modules, no matter the number of modules. * In P-NET networks, where all devices are interconnected exclusively by Light-Link, communication speeds of up to 230.4 kbit/s are permitted. This is 3 times the normal P-NET speed when compared with using standard RS485 connections. P-NET RS232 is to be considered as a point-to-point connection between two network nodes. Can be used for serial communication between a PC and P-NET controller with a serial interface. Can also be used in connection with P-NET communication via modem, serial printer connection, barcode reader or similar. 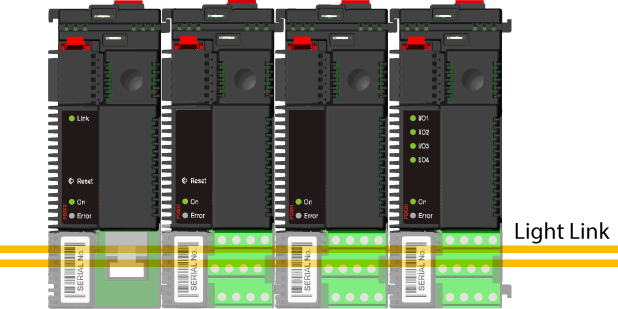 The RS232 interface is often used as printer interface. Bus length Max. 100 m. Max. 1200 m (EIA RS485) without the use of repeater. Fibre cable max. 0.5 m. Max. 12 m.